Tourists from Italy, Germany, Spain, the UK and France will not need a visa to travel to Viet Nam starting July 1, after Prime Minister Nguyen Tan Dung approved a proposal on Thursday to add the five European countries to Viet Nam’s visa waiver list. Granting visa exemptions to select countries could boost tourism growth by 8 to 18 per cent, bringing Viet Nam hundreds of millions of dollars per year, according to a World Tourism Organisation (UNWTO) report. The UNWTO presented its findings to the Viet Nam Business Forum last week. Ken Atkinson, head of the organisation’s tourism working group, said at the forum that if Viet Nam granted visa excemptions to European countries, the US, Canada, Australia and New Zealand, it would see a 10 per cent increase in tourism. Atkinson said based on visitors’ average length of stay, 11.3 days, tourists would spend around US$1150 on their trip, excluding flight tickets. This would bring the country more than $200 million per year – about 18 times more than the $11 million collected from visa fees every year. Statistics showed a projected annual increase of 5 per cent in the number of visitors from countries granted visa exemption in January – South Korea, Japan, Russia, Norway, Sweden, Finland and Denmark. The first quarter of 2015 saw a 7 per cent increase in the number of visitors from said countries. South Korea topped the list with 31 per cent, followed by Finland with a 28 per cent increase compared with the same period last year. Viet Nam’s tourism industry still had room to grow, according to the UNWTO report, but the visa policy could have a large impact on the number of visitors. The visa exemptions for countries with large numbers of Viet Nam-bound tourists were suggested to address the tourism industry’s decline in recent years. The number of tourists has fallen for the past 11 months. 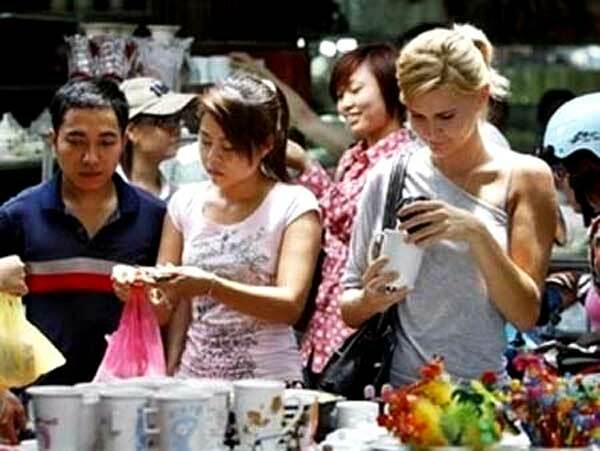 The figure decreased 12.6 per cent in the first five months of the year compared with the same period last year, according to the Viet Nam National Administration of Tourism and the Viet Nam Tourism Association. Experts said that aside from external factors like the global economic slowdown, the country’s tourism industry faced numerous challenges such as low quality of services and cumbersome visa procedures. Compared with neighbouring countries Laos and Cambodia, Viet Nam’s visas are quite expensive: $45, as opposed to $30. Tourists were also asked to present numerous documents. These factors have discouraged many agencies and tourists alike from making Viet Nam their destinations.